This bank was open from 1856 until 1881. It was the first bank to be incorporated under a provincial charter. It originally opened with capital of 30,000 pounds. Management changed in 1876 and an unscrupulous cashier took charge of the bank and made large advances that ultimately caused the bank to go out of business. Prices for any bank note from this bank start at about $100, but most are worth considerably more. Plenty of notes are worth several hundred or even thousands of dollars. Our guide below has more information. Contact us directly if you want a free appraisal. Paper money of the following denominations was printed by The Bank of Prince Edward Island: five shillings, ten shillings, one pound, two pounds, and five pounds. These could be signed by Wm. Cundall, R. Breken, T.H. Haviland, or Daniel Brenan. Issue dates are as follows: 13 August 1856, 18 August 1856, 13 October 1856, January 1st 1857, 7 April 1857, 1 January 1859, January 2nd 1860, January 1st 1862, January 1st 1863, December 1st 1863, 2 November 1868. 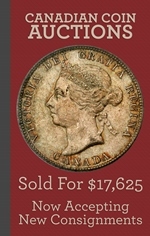 In terms of value, anything in a VF or higher grade is very scarce. Five pound and one pound notes are the scarcest denominations. Other values are just based largely on condition. One, two, five, ten, and twenty dollar bank notes were printed with a date of 1st Janaury 1872 by The Bank of Prince Edward Island. Some notes are overprinted with the phrase “Canada Currency” in red ink. That overprint affects each denomination differently. Contact us for details. 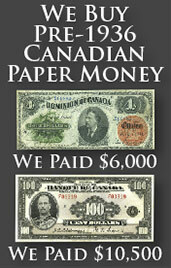 All of these banks notes were printed be the British American Bank Note Co. Montreal & Ottawa. Eight different men hand signed these bank notes. The signature never affects the value. Keep in mind that these are much more valuable as issued bank notes. Remainders are very common and worth less money. We have a $20 issued bank note from 1872 shown at the bottom of the page. These are just like the above mentioned bank notes except that these are marked as 1st Jany. 1877. Values are fairly comparable. We buy all types of Canadian currency. We are especially interested in bank notes from The Bank of Prince Edward Island in Charlotte Town. You might be surprised at how much money we can offer for some currency. Send us an email with pictures of the front and back of your bank note and we will respond quickly with our offer.